Cooling for large areas, warehouses, shops, factories, outdoor sports facilities, gyms, etc. - Brand new unit, factory fresh, not refurbished. 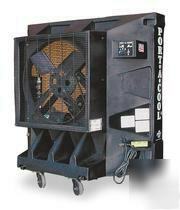 - Cooling capacity 2,500 sq. ft.